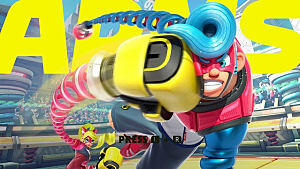 Arms is a unique fighting/boxing game that provides you with different "Arms" with which to fight your opponents. You can use the motion controls, which are pretty good if you get used to them, or multiple other control schemes. However you play, there is plenty to learn and do in this game, and I'm going to help you get started. The object of Arms is to punch or throw your opponent until they lose all their health. You can choose two Arms for each character, which all do different things. If you are using the Switch's motion controls to play Arms, then you hold a Joy-Con in each hand and literally punch with the Arm you want to use. Punching with both arms at the same time will perform a throw. You can guard punches, but throws will break through guards. If you don't want to use motion controls, there are four other control schemes to choose from: the Joy-con Grip, handheld, one joycon sideways, and the pro controller. You can also jump or dash to avoid getting hit or to make an opening for an offensive flurry. If you hold down either the jump or the dash button, you will charge your Arms. This allows you to perform a stronger punch, with an additional effect if your Arms have them. Every time you punch, whether you're hit or not, your Rush meter fills up. Once you completely fill it, you can enter Rush mode. This allows you to deliver special punches that deal much more damage and cause an extra effect depending on which Arm type you use. This only lasts a few seconds, so make sure you can hit your opponent before activating it! Most game modes also drop items and have hazards in the arena throughout the fight. Yellow areas will increase your Rush meter if you stand in them, while green areas will increase your health. Bombs make up the majority of the hazards that drop in Arms. Fire bombs will explode, dealing damage to anyone in the area and knocking them down. 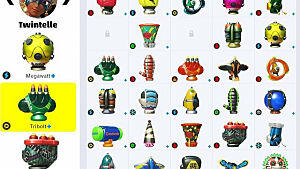 Electric bombs will explode, dealing damage to anyone in the area, and disabling both of their Arms for a short time. In this game mode, you can search online for other players to try to increase your rank. If you win a match, you will gain ranking points, and you will lose them if you lose a match. When you get enough ranking points, you will go up to the next rank. Ranked mode is a standard 1v1 fight, but there are no items or hazards in the match. You can use any Arms you have unlocked. 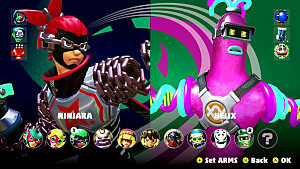 Every character starts off with three signature Arms to choose from, but everyone can unlock every other Arm in the game as well. You do this by playing the Get Arms mode. As you play the game, you will earn money. 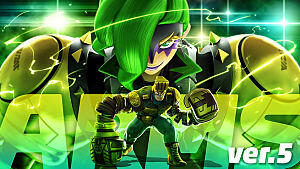 You can spend this money in Get Arms mode to unlock new Arms for your characters. In this mode, you will hit targets to move on, boxes to unlock Arms, and clocks to increase your timer. You can keep going until the timer runs out, then the game shows you all the Arms you received if you didn't see them during the match. The first Arm you get will always be for the character you are playing as, and you are more likely to get more Arms for that character the more you play with them. This is a local mode where you can play any of the following game modes. This is like a normal fight, but it is 2v2. You will stay tethered to your teammate and go flying with them if they get thrown. Teamwork is imperative in this game mode. This is a volleyball-esque game that can be played in 1v1 or 2v2, except the ball explodes if it touches the ground. Punching the ball will send it toward the opponent's side. If you punch with both arms at the same time, you will "set" the ball for a spike. The first person or team to reach 5 points, or have the highest score when time runs out, wins. This is a basketball-esque game, where each fighter is the ball. The object is to throw your opponent into the basket for points -- punching doesn't count. This is 1v1 only, and the first person to 10 points, or the most points when time runs out, wins. This is a target-hitting game mode that can be played 1v1 or 2v2. 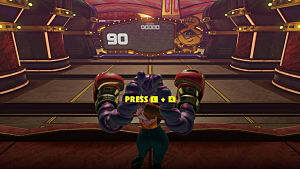 Targets show in the arena between each side, and fighters must try to hit the targets before their opponents do. You can also hit or throw your opponents to earn points and stop them from hitting targets. You can gain extra points for hitting multiple targets in a row. The side with the most points when time runs out wins. This is a single-player only mode that has you fighting against 100 A.I. opponents. They come out in waves of 10 at a time, and a health item is dropped in between each wave. This game mode gives you three random Arms to choose from in each fight. 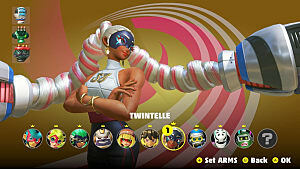 This is great if you want to try the different Arms for a character before you try to unlock new Arms for them. 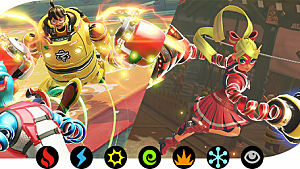 This mode has several training options to choose from, all of which involve dealing with and overcoming a specific mechanic. For example, you can do a "Don't get thrown exercise" where the A.I. will constantly try to throw you. This is good for getting better at something you have always had trouble with. This is an online mode that you can join solo or with another player. In this mode, you join a lobby where you will be randomly matched with other players. to face off in game modes like fight, team fight, skillshot, hoops, v-ball, or a boss fight. You also earn extra points the longer you stay in the lobby. 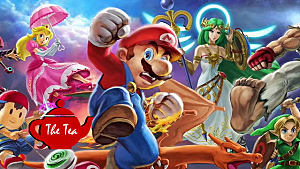 These game modes allow you to play with friends on different Switch consoles. Friends lets you play online with people on your Friends list, while Local is for any nearby Switch consoles. Arms is more like a boxing game than a fighting game. Be sure to guard, jump, and dash at the right times, then punch or throw when you get an opening. When you block a punch with guard, you can immediately punch afterwards to counterattack. If you hit your opponent with a Rush attack in Hoops, it will throw them into the basket. Those are all the beginner tips I have for Arms. Let me know if you have any questions or other tips that should be added!